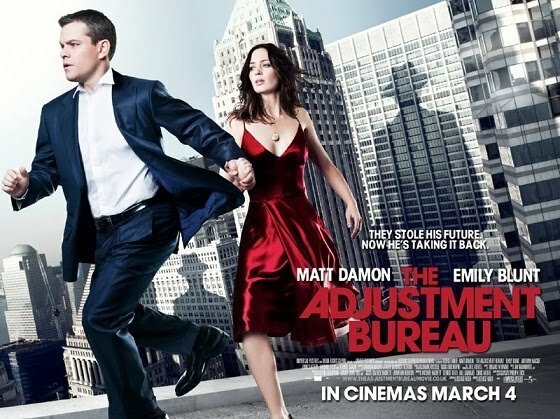 Attempting to strike while the iron is hot, I figured a quick review of the Adjustment Bureau might be helpful given this morning’s earlier NYT post. We posted the trailer for Bureau waaay back in June of ’10, chuckling at the movie’s tag line: “If you believe in free will, will you fight for it?” After seeing the movie, I figured I’d share a few non-spoiler observations about the movie, which turns out to be less preachy on the subject than you might imagine. The movie surprisingly presents a sympathetic understanding of the bound will. The “angelic” characters with the bureau step in regularly to intervene with the lives of human beings, driving the right person to the right place at the right time, setting up a chain reaction of events that change the course of the whole world for good. These “angels” disclose that human beings can’t help but flub up the world every chance they get, andwould destroy themselves if they didn’t intervene. All is well and good, of course, until Matt Damon rejects his “divinely appointed future” for the woman he’s fallen in love with. All of this is revealed to the audience at the movie’s beginning. will is only given to those who deserve it,” an ironic Pelagian twist pitting works righteousness and freedom of the will against each other. Free will isn’t the ideal of the picture- free will is the problem. And while Matt Damon might be self-actualized enough to earn his free will, what about the rest of us? For further comment on this, I refer you to this morning’s post about James Franco and Bradley Cooper. I would also recommend our resource page, where you can find a great primer on the subject by John Zahl, “Free Will (and the Lack Thereof)” under the section titled Misc. Talks & Articles (scroll down to the bottom, look on the right!). So the "Angels" are responsible for Neoliberalism and Banking Collapse?